Derrick studied International Relations at Keele University and additionally obtained an MBA at the University of Sheffield. Since, he has held marketing positions within companies such as Railtrack, Barclays, Frost & Sullivan and Michelin Tyre Plc. Presently Head of Marketing at TDK Systems, part of Tokyo-based TDK Corporation, Derrick is also a member of the Institute of Directors, the Chief Marketing Officer Council, as well as a member of the Chartered Institute of Marketing. Derrick is presently working closely with the Bluetooth Special Interest Group, helping them to facilitate the adoption of Bluetooth technology. In addition, he works to sponsor its adoption, by promoting awareness, knowledge and education about Bluetooth Wireless Technology working with key partners including Sony Ericsson and Plantronics. For more than a decade, TDK Systems has been at the forefront of mobile communications technology – helping to create, test, refine and bring major new industry standards such as PCMCIA and Bluetooth to market. As a wireless technology innovator, TDK Systems has earned wide recognition and awards for its hardware and software products. The company has been involved with Bluetooth wireless technology since its creation, seeing Bluetooth as a key technology in the mobile communication, PC communication and other mobile working segments. The company has built up a network of industry partnerships and alliances. TDK Systems working with recognised leaders and major mobile technology companies including Cambridge Silicon Radio, Carphone Warehouse, IBM, Microsoft, Motorola, Palm, Plantronics, Sony Ericsson, Vodafone and many others. Working with its partners, TDK Systems helps to define new products and enable their customers to get the best from mobile technology - both now and in the future. The company believes in sharing its knowledge and vision of technology with other companies so that together the future is shaped. TDK Systems has earned a reputation for innovation and expertise and markets products and solutions through the PC and mobile phone distribution channels across Europe. Having developed a strong presence in key markets the company is using its achievements to open new market places where wireless technology promises significant returns. TDK Systems believes that technology should work for people, that mobile technology should bring convenience, efficiency and enjoyment to people both in their business and personal lives. Some of the biggest users of mobile connectivity chose TDK Systems. Why? The answer’s simple. They know that the company’s technology can help shape their future. Bluetooth technology has exited from the hype phase. A new industry has been born; Bluetooth has tremendous momentum with many hundreds of companies developing and producing products. TDK Systems is active at multiple levels in the Bluetooth technology marketplace with its technology incorporated in modules, in custom designs, as private labelled product as well as its own brands. Today Bluetooth has become the de-facto standard for connecting data capable handsets to other devices such as handheld, laptop and desktop computers. Bluetooth is the glue that allows mobile applications to become compelling and ubiquitous for the mobile worker. Bluetooth simplifies remote and mobile applications allowing the user to make use of “dead time”: to connect where and when he or she needs to. Users may have 100Mbits/s LAN Access in the office, 10Mbits/s within range of a Wi-Fi access point – but the GPRS Bluetooth-enabled handset means users can connect easily virtually everywhere in Western Europe and in may other parts of the world at speeds of 30 to 40K bits/s. Bluetooth is being integrated in products such as handsets, printers, notebooks and handheld devices such as PDAs, more and more adapters are available to equip existing devices. Bluetooth allows devices to exchange, synchronise and transmit data; allowing peripherals to be shared, allowing devices to interact and unite in the personal area surrounding the mobile user. Bluetooth is in volume production – TDK Systems now ships more wireless products than wired products, the company has shipped over 200,000 Bluetooth adapters. Economy of scale, cost reduction and availability of Bluetooth silicon is driving costs down strongly, Bluetooth may already be the lowest cost wireless technology of the future. As a reflection of its ubiquity, Bluetooth chipset volumes are fifty times greater than other volume wireless chipsets in current production. Many factors are driving adoption. Undoubtedly, the availability of Bluetooth in mobile phone handsets has become a tremendous driver for the industry. Many estimates for the number of devices being shipped are available from industry watchers and analysts. Estimates vary, TDK believes that a figure in the order of 1 million Bluetooth-enable mobile handsets have been shipped each week boosting the installed base of mobile handsets from 25 million to 75 million in 12 months. The connectivity capability of today’s handsets, combined with their developing multimedia content capabilities, means that users increasing need to connect handsets to greater computing such as a PDA or computer to gain the benefit of their capabilities. For example, a data bandwidth of 30 to 40 kBits/s terminated on the mobile handset is not particularly useful – even for browsing WAP pages. Contrastingly, the same bandwidth is very useful when combined with a mobile computer – allowing email, Intranet access and remote applications to function substantially as they do in the cable connected realm of the office. Eventually, TDK Systems envisages that users will but Bluetooth handsets and connectivity devices at the same time; particularly as the trend for personalising and accessing the multimedia capabilities of handsets becomes more and more popular with consumers. TDK Systems has created a new type of PC adaptor in this mobile entertainment sector that functions as a fully specified Bluetooth adaptor but also allows consumers to have fun with their phone by customising its wallpaper and screen image. Early in 2004 the company will launch a content portal that will allow users to access a unique range of multimedia content that user acquire via subscription. Content will be sent direct to consumers’ computer’s avoiding the need for content to be paid for using the premium Over The Air distribution model. The strong demand for picture phones has also triggered demand for Bluetooth adaptors for computers. Many camera phones have Bluetooth capability; by utilising this users can transport their pictures from the phone to their PC in a few seconds. Once the image is available on the PC the possibilities for enjoying, using and sharing content are amplified, costs are also reduced – sending a photo as an MMS message has a distinct premium compared to sending a picture as an email attachment for virtually no cost. Bluetooth is proving to be a flexible and adaptable solution in diverse application areas. The integral suppleness of the technology is key; the core technology is now headed in additional, new directions and creating new niche and vertical market opportunities. As well as developing strongly as a mobile handset and computer connectivity medium Bluetooth is entering sectors as diverse as automotive, the F1 arena, performance yachting, healthcare, retail, public services and entertainment. Responding to these developments, TDK Systems is adopting a vertical sector focus to tap the potential. An important area of opportunity developing is the industrial sector. In 2003, TDK Systems introduced a Bluetooth module capable of connecting existing devices and sub-systems; such as factory automation, which requires no intelligence in such systems. In this sector it is common to find that cabling represents a significant capital outlay as well as a sizeable maintenance cost. Bluetooth is an excellent cable replacement technology, it has the ability to replace many different cables carrying different types of signals such as analogue, digital and electrical control and telemetry signalling. Often, a major obstacle for new technologies is the knowledge and familiarity barrier. New technologies need time to become accepted, understood and applied successfully at the engineering level, TDK Systems blu2i technology targets this barrier and reduces it dramatically. blu2i technology in the series of modules for embedded electronics, industrial and other integrated application features an embedded Bluetooth protocol stack allowing the modules appear as a conventional RS232 serial interface. In this way, legacy and even non processor-based equipment can be converted to cable-free operation. The modules also feature a rapid application development capability: the development kit usually allows devices to be connected over Bluetooth in about 30 minutes. TDK Systems has reduced the application evaluation time as well as removed the need for RF and wireless experience as well as the need for Bluetooth approval: this can save approval costs of approximately €30,000 to €45,000. In the corporate computing sector, Bluetooth is now being understood and appreciated as a mobile efficiency technology. Bluetooth allows mobile workers to recoup a significant degree of the dead time that travel and roaming workers suffer. Many corporate level users have now learnt that Bluetooth and Wi-Fi are complimentary technologies that do not vie with each other in wireless applications. In fact this always was the case; Bluetooth has emerged strongly in mobile device connectivity allowing efficiency gains from getting mobile devices working better for the mobile worker whereas Wi-Fi is an excellent solution for de-cabling office computers and for static hotspots. Bluetooth has an agreeably low cost of ownership (TCO) and, importantly for this and other sectors, its security implementation has proven to be robust. In a study published in 2003 TDK Systems highlighted not only these factors but the rapid pay-back that the technology rewards business users. 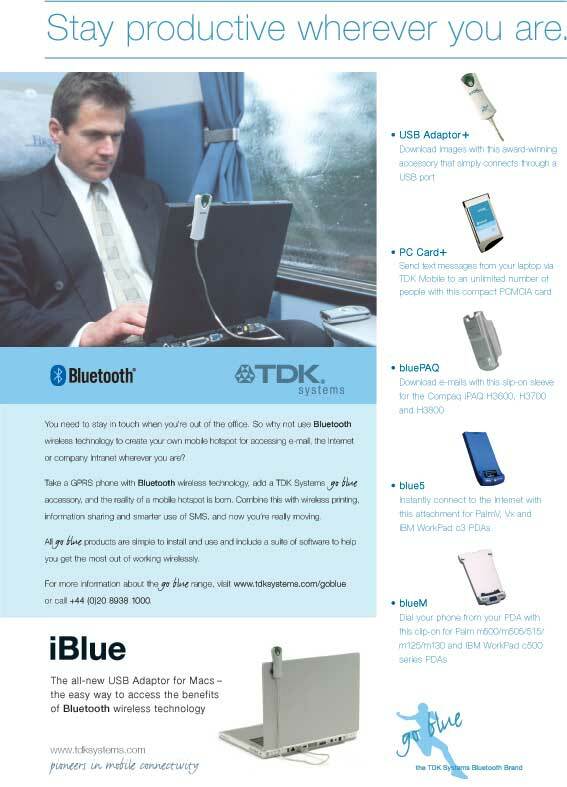 TDK Systems is working with corporate scale and business users, developing mobile computing policies to aid recognition and awareness of Bluetooth’s usefulness and value. As wireless technologies and opportunities for Bluetooth develop TDK Systems remains focussed on developing its partnerships and relationships. With its own products the company seeks to create and exploit a positive user experience that engenders loyalty to its brands. The quality of the user experience, satisfaction and fulfilment from Bluetooth products and associated applications are paramount factors. TDK Systems believes in discovering and maximising the potential of Bluetooth today - rather than hopping to the next technology “lily-pad”. Reflecting on the consumer, corporate and vertical market opportunities TDK Systems continues to differentiate its products and focus on each of these three key areas. The company’s product orientation is on application development – providing software applications that allow users to take advantage of Bluetooth making it a useful, compelling and valuable part of their mobile lives. Education is an important aspect for the future all wireless technologies. TDK Systems has developed education, information and training products targeted to help all types of users learn about, adopt and develop wireless technologies applications. TDK Systems provides knowledge and targeted information from its B-Informed education portal. At www.b-informed.co.uk the company highlights applications, case studies, white papers and provides technology briefings. As TDK Systems and Bluetooth move ahead, knowledge, awareness and experience remain vital.